At Ricco's Creations our desire is to help you & your loved ones add that special sparkle to your appearance & to your life! Our beautifully designed jackets will do that for you. Wearing one of our creations will enhance your beauty & add a special flair to your look! And fun to your life! These works of art attract much attention from friends, family & soon-to-be new friends! 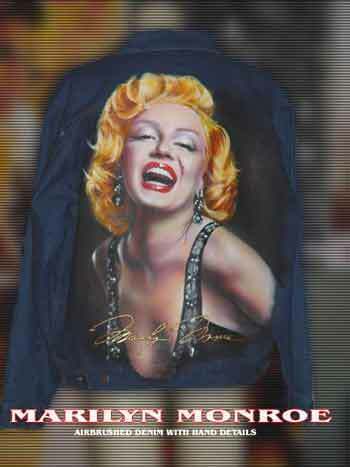 Imagine walking through a mall or grocery store or going to the movies wearing a hand-made painting of your favorite star! Or one of our patriotic jackets, proudly displaying your love for our country! The artist personally designs each painting. He devotes many hours to each piece - painting by hand & airbrush in exquisite detail, then applying by hand each Austrian Crystal Rhinestone. He has been doing these jackets for over 16 years. His expert understanding & use of color, light, & shadow are phenomenal. Each finished portrait is so life-like, it's hard to take your eyes off it. The paintings leap out at you in true 3-D fashion. The eyes often appear to look directly at you & you feel as if that person is really making eye-contact with you. And if it's one of your favorite entertainers or a well-known figure who you greatly admire, that can be a wonderful thing! To view such well-done artwork, so lovingly crafted, is inspiring & uplifting. The artist deeply loves his craft & it shows in each finished product, which he designs with the utmost care & concern for his customers & with true devotion to his craft. His desire is to express the perfection that he beholds through his artistic eye - to share the awe & reverance, the enthusiasm & joy, the depth of our human lives! You & your loved ones will feel extra special wearing one of these unique creations!